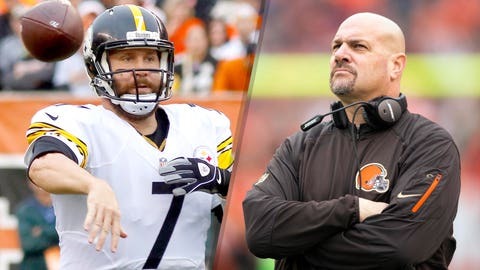 Ben Roethlisberger and the Steelers will look to bounce back and keep their playoff hopes alive this Sunday against Mike Pettine's Cleveland Browns. A week after their postseason hopes went into a tailspin, the Pittsburgh Steelers will look to avoid a second straight upset at the hands of a divisional opponent. The Steelers (9-6) have just one way to get into the playoffs and it starts with a win in Cleveland against the 3-12 Browns. The rest is in the hands of the New York Jets, who must lose in Buffalo to abdicate the sixth and final seed to Pittsburgh. Ben Roethlisberger will look to rebound from his dreadful two-interception performance in Sunday’s loss to the Ravens. The defense will also need to step up its game after getting outmatched by Ryan Mallett in his first Baltimore start. The Browns don’t have much to play for in the standings besides a higher draft pick in 2016, but they haven’t given up on head coach Mike Pettine. They hung tough last Sunday in Kansas City before running out of time on the final drive. The jobs of Pettine and general manager Ray Farmer hang in the balance, but Cleveland would love nothing more than to end its season on a high note by spoiling the playoff aspirations of its division foe. It may have to come with Austin Davis back at quarterback, as Johnny Manziel arrived at practice Wednesday feeling the effects of a concussion. For some reason, the Steelers ran the ball on six of their first seven plays last week in Baltimore, eventually getting stuffed on 4th-and-1 in Ravens territory. Roethlisberger never looked himself and head coach Mike Tomlin even conceded that the early run-heavy attack may have prevented his quarterback from getting into a rhythm. Last week, Roethlisberger seemed to force the ball deep, even with Baltimore keeping its two safeties deep for most of the day. The NFL being a copycat league, the Browns may do more of the same. The Steelers should respond with a lot of crossing routes underneath since Cleveland’s suspect corners won’t be able to keep up with Pittsburgh’s immense receiving talent. From there, all Roethlisberger has to do is be patient and hit the open man. The Steelers have just three sacks in their last two games and were unable to generate much pressure against Mallett last week. Whether its Manziel or Davis at quarterback, Pittsburgh is going to have to bring more than four players to get pressure. If Manziel manages to make it back, his ability to scramble needs to be accounted for. Speedy middle linebacker Ryan Shazier is the man for that job. Baltimore picked apart the Steelers secondary going almost exclusively with short passes by Ryan Mallett, who started less than two weeks after signing with the club. All but three of Mallett’s 41 passes were of the short variety, and he completed 70 percent of them. Davis or Manziel need to make the right read and get the ball out quickly. The biggest weakness in the Steelers’ defense is in the secondary. The Browns’ two biggest threats in the passing game are tight end Gary Barnidge and receiver Travis Benjamin. Cleveland should attack the same side of the field with both players. Doing so would force Pittsburgh’s safeties into coverage decisions while also making it easier for whoever the quarterback is to go through his progressions and hit the open target. The weakest link on the Steelers’ offensive line is the enormous but inexperienced left tackle Alejandro Villanueva. Veteran linebacker Paul Kruger normally rushes from the other side, but he may be able to teach Villanueva a thing or two by switching sides. If not Nate Orchard has the quickness to make Villanueva miss and get pressure on Roethlisberger.